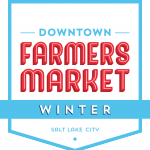 The Downtown Farmers Market presents the Winter Market between November and April to offer Utah residents more year-round opportunities to access fresh local goods from local purveyors. Hosted in the historic Rio Grande Depot, this market allows growers to extend the season, and features fresh vegetables from late season harvests and area greenhouses. Like the summer markets, it also offers the best of the region's grass-fed meats, dairy, honey, eggs, baked goods, and seasonal offerings for the holidays.